Society rests in a siding at Highley Station, SVR. When Stanier's 2-8-0 7F class of freight locomotives, soon reclassified 8F, was introduced in 1935, amongst other things they triggered a major change in the heavy limestone traffic between the quarries at Tunstead, near Buxton in the Derbyshire Peak District, and the I.C.I. processing works at Northwich. Thanks to their sturdy tractive power, it became possible to introduce massive vacuum braked bogie hopper wagons specifically designed for this traffic, and for something like thirty years the 8F's remained closely associated with this service. As far as we know, 48773 was never itself involved, being shedded elsewhere, but more than once since it came into preservation we did initiate tentative enquiries to see if there was any opportunity for it to haul a commemorative train over this route in deference to other members of the class which had spent much of their working lives doing so. The traffic continued long after steam was dethroned in favour of diesel power and, of particular interest to the Society in view of the long 8F association, rakes of the wagons also survived in regular use. When more recently numbers of these were declared redundant, we therefore wondered whether it might be possible to preserve some. 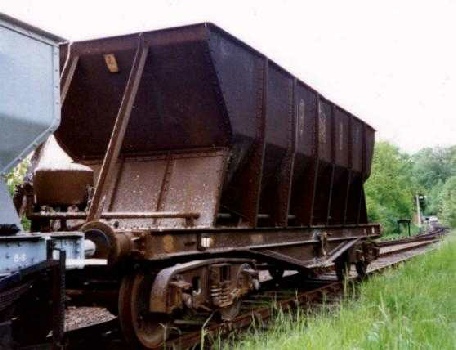 It is easy to get carried away - at least one member proposed rescue of a 10 or 12 wagon rake to make 'a proper train' - but, as with all railway vehicles, the problem is often less initial cost and more the matter of where they can be kept: as far as we know, no private railway has extensive unused siding space! Negotiation with SVR secured agreement to accepting two if we could obtain and transport them, subject to inspection of their running capability and general condition. This took some time but proved satisfactory, none have previously been preserved and the two we selected and which had been set aside for us duly arrived. We set up delivery so as to permit both wagons to make an early appearance in the consist of the Photographic Freight Charter on 3 May, but an extended commitment of three low loaders to the A4 Locomotive Society (4498, tender and support coach) prevented Alleley's from managing this and the next 'window of opportunity' was Saturday 7 May. It was to be a day Ken Kitchen (masterminding removal from Buxton) and Bob Cross, Bill Murray and Keith Tyler (available to assist unloading and stabling) now recall with a degree of wry amusement. The first hopper - no. 19129 - was loaded at 19.00 at Buxton Lime Industries on 6 May and arrived earlier than expected at Kidderminster the following morning, being unloaded and positioned shortly after 09.00 without help from Bob, the only one of the '8F team' present at the time: the second (both, according to the message Keith claimed to have received) was scheduled to arrive soon after lunch. The reception committee wiled away a pleasant afternoon. No sign of loader or hopper. About 16.00 Bill extorted a message from Ken, which station staff had received some 2 hours earlier and made no attempt whatever to pass on, indicating the second hopper was being loaded at 14.00 and would shortly be starting out. Further time passed. It was a very relaxing day - by no stretch of the imagination could this be described as a working party! Towards 18.30 Bill managed to contact Ken by phone, to hear the low loader, having encountered a mechanical problem, had retired to Studley for the night. (This defused Rob Newman's surprise, while returning home from a model railway event in Redditch, at seeing what was clearly our hopper proceeding in an entirely wrong direction.) The (non)working party concluded their discussions and withdrew to devote their unconsumed energies elsewhere. The second hopper, after sundry technical and administrative problems had been unravelled, finally arrived at Kidderminster on 16 May. A second attempt to display these new acquisitions to an eager audience was also thwarted. We had hoped to attach them to the inspection saloon specials we had chartered for 18 June, the day of the AGM. It transpired, however, that to do this the hoppers would have to be accompanied by a brake van, leading to repetitive shunting during the day which could not be accommodated in the two return paths we had requested and been allocated. At that time one hopper was at Kidderminster, largely concealed behind visiting diesels and other stock in the yard, and the second was at Highley. What of the bogie hoppers themselves? Both are ex I.C.I., purchased from Buxton Lime Industries Ltd. on 8 November 1993, and both were designed and built by Charles Roberts & Co. of Wakefield. They each have a capacity of 1230 cu. ft., weigh 43.5 imperial tons fully laden, and are of all steel construction. Both our vehicles were built for I.C.I. 's stone traffic from Tunstead Quarry to several of their mid Cheshire works, and they covered many miles over the routes of the Cheshire Lines Committee, motive power ranging from Super D's and Derby 4's to the ubiquitous Stanier 8Fs. Class 9F locomotives were never used on these runs as diesel traction took over from the 8Fs. Similar vehicles built for John Summers and Sons Ltd. were unfitted, and as such carried a somewhat higher payload; when I.C.I. bought these they had them vacuum fitted. equipped with automatic vacuum brakes in addition to either side hand-brakes, the power cylinders being fixed at each end of the frame, applying four blocks to each bogie. The actual hoppers are 29 ft. 6 ins, long by 7 ft. 11 ins, at the top, decreasing to 18 ft. 3 ins, by 2 ft. 1s ins, at the bottom, with a depth of 7 ft. 11 ins. The load is discharged between the rails through two bottom doors, each having a clear opening of 7 ft. 7.5 ins, by 2 ft. 1.5 ins. These doors are fitted with a patent opening and closing device, the load inside forcing them open when they are released, at the same time compressing the springs that control them: on reaching their full-open position the doors are held in a catch until the load is discharged, when, on being released, the energy stored in the springs forces them back into the closed position. The whole operation of releasing, discharging and reclosing is said to take less than 2 minutes. However admirable for their original purpose, this will hardly be ideal for discharging ballast, a task for which we would like them to be available when appropriate, and we may therefore discuss with the SVR a means of modifying this mechanism on one or both of the wagons. BR TOPS no. 19052 - built 1938 as wagon no. 3252, LMS registration no. 151397. Neither vehicle had current general repair tickets. Official tare weight is quoted as 23 tons and both have 18 in. diameter vacuum cylinders. Your Board have decided to restore the post-war vehicle to that of I.C.I's. colour specification at overhaul, all grey with black wheelsets and white lettering, and to restore the older one in the experimental livery of 1936/37. Smaller lettering for 'I.C.I.' was used on pre-war hoppers; a very much smaller 'Ltd.' was not added after late 1937. Builders and owners plates will be reinstated during this work. We are now negotiating with Severn Valley the repainting of both hoppers at the Society's expense, which Black Eight Railtours are kindly offering to underwrite. and many others, too numerous to mention. Our grateful thanks to all concerned. The two ex-ICI limestone bogie hopper wagons owned by the Society currently reside on the truncated stub of the Stourport-on-Severn line at the 'Bewdley Triangle' on the Severn Valley Railway. They remain in 'as received' condition despite the best intentions of all concerned to begin a restoration programme. One of the wagons did see some 'departmental' use carrying rock at the time of the Sterns rebuilding, but for most of the time on the SVR they have been of passing scenic interest rather than working wagons. Plans do exist for their restoration, and replacement plates and cast lettering are available for fitting as the vehicles are refurbished. This type of vehicle has attracted quite a following, being a type which remained in service long after their contemporaries had been scrapped. They were used on the heavy limestone traffic from Tunstead quarry and were for a long while hauled by Stanier 8Fs. At the end of steam the wagons were diesel-hauled on the same traffic, initially by Class 25 type 2s and latterly by Class 37 type 3s. Photographic evidence suggests that such loaded trains were often characterised by the long trails of white dust blowing from the open tops of the wagons. Several have been preserved in addition to the two in the care of the Society. The prototype, No 19000, is fortunately one of those saved. Some remain in an internal user role at the quarries, and others are currently stored awaiting disposal. Many others have already been sold for scrap. Readers who also take 'Traction' magazine may have read letter from Paul Gibbons who is putting forward the idea that a rake of bogie limestone hoppers should be secured for use as a complete train. This idea had been suggested previously following the success of the 'windcutter' train used on the Great Central Railway. As with many potential vehicle preservation schemes there are often higher costs in transporting the preserved wagon. than those involved in the initial purchase! Paul goes on to suggest that there may be a case for a strategic reserve' of older wagons to be built up as part of a wider railfreight scheme. The question of braking could prove to be a stumbling block as current freight wagons are air braked and the bogie limestone hoppers work on the vacuum system. Paul Gibbons is keen to hear from anyone with anything to say on these ideas, especially if they have a source of finance or a suitable site to house preserved wagons. He can be contacted at Wingfield Station, Oakerthorpe, Alfreton, DE55 7LJ. For some while now the Society has been offering a postcard and coaster featuring a painting by George Heiron of our locomotive as LMS 8233 on such a train of bogie hoppers at Chinley. The painting was originally commissioned by Ian Allan Ltd as an illustration for the definitive book by Alan Wilkinson called 'Stanier 8Fs at Work' (also available from Society Sales). The original painting has since been purchased from Ian Allan Ltd by a member of the Society Board.